It’s not so much that Shakeology makes you poop. It’s more along the lines that Shakeology helps you digest food better and help you become more regular. All of the digestive enzymes and prebiotics in Shakeology help your body gently eliminate the toxins that are in your body from the processed foods you eat. Knowing that, you could say that Shakeology does make you poop. Most people who are overweight when they start using Shakeology will notice what Shakeology can do in regards to going to the bathroom. My uncle dropped 7 pounds in just 3 days of using Shakeology. And it was all from going to the bathroom. Hilarity in sued after he told me but he also said it was the first time in 20 years that he had pooped that much. Hilarity followed again. In all seriousness though, it’s very important to be regular so you get the toxins out of your body. So much of the processed foods we eat get stuck in our system and make simple functions harder to do. So yes, Shakeology will help you poop. Probably more when you start using it and then more on a timed schedule after you get most of the toxins out of your system. It’s still very important to be using Shakeology everyday or otherwise it won’t have the same effect. It has for me. 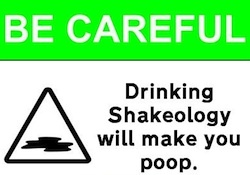 Shakeology is not a laxative so you’re not going to be running to the bathroom after taking it. Its also not a pill that will make you crap your brains out. Shakeology goes to work on helping your body function normally in every department. Including the poop department. If you’re having issues in the pooping department I recommend getting a sample pack of Shakeology and seeing which flavor you like before going all in with a bag.